Las Vegas Announces Two-Year Player Development Contract (PDC) With Oakland A's Through the 2020 Season! 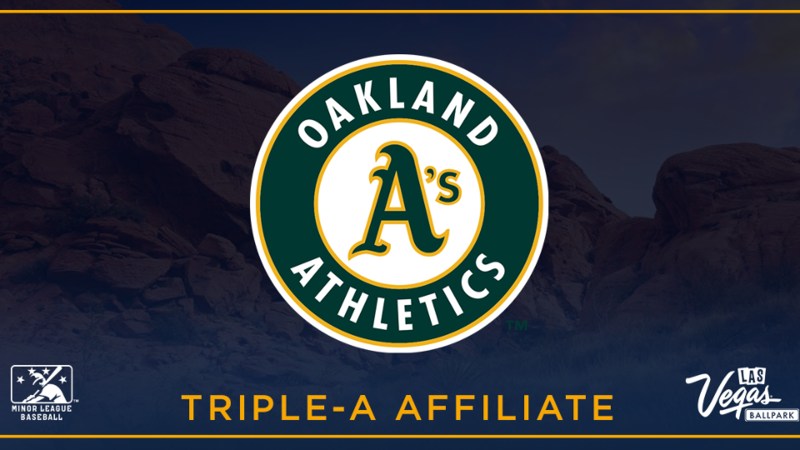 LAS VEGAS: The Las Vegas professional baseball team of the Pacific Coast League (PCL) and the Oakland Athletics, member of the American League West Division, announced today a two-year Player Development Contract (PDC), through the 2020 season. The Team, on September 3, completed their 36th season in the PCL and final campaign as the Triple-A affiliate of the New York Mets. The Mets purchased Triple-A Syracuse on October 20, 2017 and will begin play in the International League in 2019. "We are excited to have the Oakland A's as our new Major League affiliate," Team President/COO Don Logan said. "I have known Billy (Beane) for a long time and consider him a friend. The relationship with the A's goes back to the 1990's when they played regular season games in Las Vegas (1996). "The A's have enjoyed great success at the Triple-A level with their minor league system which has been second to none. The new PDC will provide a tremendous environment for the players with the state-of-the-art amenities that will enhance player development with the indoor hitting cages, mounds and workout areas in the Las Vegas Ballpark. "The proximity with the Bay Area to Las Vegas will also provide the opportunity to move players much easier regarding the roster transactions from the Triple-A to the Major League level. McCarran International Airport has non-stop flights to the numerous PCL markets, as well as the big cities, that enables our team to have the best travel in the 16-team league. "This will be a great situation for our fans to watch top prospects in the A's system as well as players on Major League rehabilitation assignments showcase their talents in the Las Vegas Ballpark." Oakland, 90-60 (.600), is currently in second place in the West Division, 4.5 games behind Houston. The A's are 1.5 games behind the Yankees for the first Wild Card playoff spot. "It is an incredibly exciting time to partner with the Las Vegas Team," Athletics Executive VP of Baseball Operations Billy Beane said. "Their ownership group is committed to providing a first-class environment for our players, which includes the grand opening of the Las Vegas Ballpark for the inaugural season of our affiliation. We're looking forward to working closely with Don Logan and his staff as we both work towards putting a championship club on the field." OAKLAND A'S: The A's are celebrating their 50th Anniversary season (1968-2018) in Oakland and have captured four World Series Championships overall (Oakland), including three straight from 1972-73-74, and 1989. The A's retired numbers include: Jim "Catfish" Hunter (27); Rollie Fingers (34); Reggie Jackson (9); Dennis Eckersley (43); Rickey Henderson (24). Oakland played the first six games of the 1996 season at Cashman Field due to renovations of the Oakland Alameda County Coliseum. The A's hosted Toronto and Detroit from April 1-7. Fans can reserve their spot in the new Las Vegas Ballpark by placing a season ticket deposit for just $100 per seat; $100 per seat for club seat and $100 for a group event. Customers who place a deposit will be able to select their seats after current Las Vegas season ticket holders. Deposit priority will be based on the time and date of deposit. Inventory is limited on season tickets and the opportunity to purchase will be determined on a first come - first served basis. Priority order is based on 2018 season ticket holders, followed by customers who make a $100 deposit and finally the general public. The $100 deposit will be kept on the customer's account to secure the priority. At the date of the purchase, the deposit will be applied towards the total cost of the season tickets or group event. All deposits are refundable if customers decide not to purchase tickets. NOTE: For fans that are currently a SEASON TICKET HOLDER or GROUP BUYER, there is no need to place a deposit for the 2019 season. For further ticket information, call the 51s office at (702) 943-7200. Official licensed Las Vegas team merchandise is available on the "Team Shop" section of the website.